Each player starts with a small village, which he – gradually building up – with the help of a good raw material production. In the end you’ve probably conquered several villages and are part of a powerful alliance. 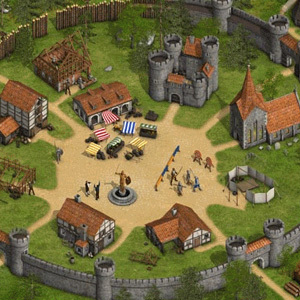 This medieval browser game currently enjoys great popularity. There are online games have still other medieval games, but added, „The tribes“ in comparison to other online games has the advantage that this is primarily a strategy game. Browser games like this all have a similar initial strategy. First, you should – as already mentioned – the online games ensure that commodity production runs smoothly. Pass it on so that the clay pit, the iron mine and the loggers will be expanded accordingly. Then must be ensured that the excavated materials are safe even from looters. Why You care most immediately afterwards that the hiding place is built and enlarged, as you can get there, their raw materials in safety. If the commodity is once saved, you can log on the production of concentrated forces and establishing trade relations with other players. With the help of a barracks (requires Main Building level 3) is the formation of spearmen possible. Although they are a rather weaker military unit, but you should capture them with weaker players some raw material. If you prefer to deal with your teammates, you need a marketplace. If you’ve developed a bit of everything first, You should strive for membership in a tribe. Look at the choice available to tribes for this well before you one of them joins, because each tribe is pursuing its own goals. In addition, at least some other members are in the vicinity of your village, so you stand in isolation in the event of a fight and hope for quick help your colleagues may. And then this strategy game is only really going on …. Medieval Games like this are very time consuming, but worth the effort. If you play this online game online, you need as a player very much skill as a strategist and a diplomat. Unlike similar games, such as the previously mentioned „The settlers“ bsteht the challenge is that we are dealing here with human players, which are of course much more difficult to figure out how the AI of the computer. Naturally, therefore, the interaction with the other strains is much more exciting. In summary it can be said that the „tribes game“ is one of the most interesting browser games with medieval theme. It’s great if they make war on two different alliances as a party and you do not know whether you’re at the end of the war are on the winning side or the other the loser.